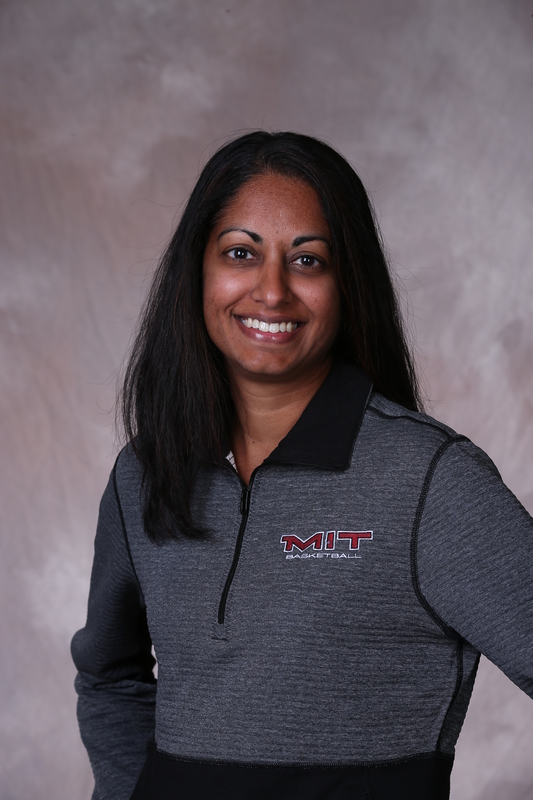 The 2016 and 2017 NEWMAC Coach of the Year, Sonia Raman is MIT’s all-time winningest coach as she enters her 10th season at the helm of the Engineers’ women’s basketball program. Under Raman’s tutelage, MIT has generated 44 NEWMAC Academic All-Conference accolades, including a league and program-high seven during the 2016-17 season. The Engineers have appeared in the Women’s Basketball Coaches Association Academic Top 25 on four occasions, highlighted by top-10 placements in 2010-11 (third place) and 2016-17 (seventh place). Raman’s student-athletes have garnered a trio of CoSIDA Academic All-America honors to go along with one NCAA Postgraduate Scholarship selection. Eight of Raman’s student-athletes have earned NEWMAC All-Conference accolades, including a pair of conference Rookie of the Year awards. She has also had three seniors selected to participate in the New England Women’s Basketball Association Senior Classic. In addition to leading the Engineers on the court, Raman fills a key role as the Assistant Director of Compliance for the nation’s most expansive athletic program. Prior to her arrival in Cambridge, Raman was the top assistant coach at Wellesley College. During her six-year tenure, she scouted opponents, assisted with practice and game planning, managed individual player skill and leadership development, and served as the Blue’s primary recruiter. Raman began her intercollegiate coaching career with a two-year stint as an assistant coach at her alma mater, Tufts University. A four-year player and a captain for the Jumbos, she graduated in 1996 with a Bachelor of Arts degree in International Relations. Raman went on to receive a Juris Doctor from Boston College Law School in 2001. She is also a 2015 graduate of the NCAA Women’s Coaches Academy. In her spare time, Raman is a volunteer coach with the Newton (Mass.) Special Olympics tennis team. She also serves on the advisory board for Find the Courage, a nonprofit organization that inspires, educates and empowers young people to be positive leaders promoting kindness, inclusion, encouragement, compassion, respect and resiliency in their communities.